With Thanksgiving Day just around the corner, many of us are already looking forward to putting on our elastic-waisted pants and filling up at Mom’s dinner table. But what you may not realize is that Thanksgiving day marathon-eating can cost you upwards of 3,000 calories in just one day! 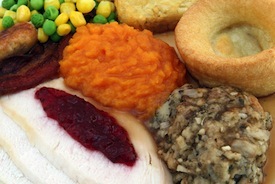 However, there are ways to eat and feel full without having to go back for seconds, thirds or forths. The idea is to volumize the food you eat so that the size of the food is large but the calorie count is low. Things that most easily come to mind are vegetables. Two 7-8 inch carrots are just 60 calories in comparison to say 20 pieces of candy corn that’s 150 calories. A better example is regular pasta versus squash pasta. One cup of regular pasta has 220 calories while squash pasta has just 155. Plus, the latter packs way more vitamin C and B! classic breakfast wrap from Starbucks could be considered healthy eating. But if you are trying to lose weight and are still hungry after your morning meal, try another tactic. While those examples are roughly the size of your fist, what if your breakfast could be as big as a side plate, have the same amount of calories and keep you fuller longer? 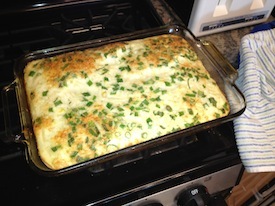 One of my favorite breakfast meals to make is an egg white casserole. The dish below has about 1,050 calories and serves six servings. Ingredients include three cartons of egg whites, one bag of hash browns, ¾ C of green onions, ½ C of parmesean cheese, one small white onion and garlic powder. Add refried black beans at 500 a can and it’s about 280 per meal! On a larger scale, let’s plan for lunch of dinner. The photo to the left is of a chicken stir fry with the following ingredients: green onions, broccoli, carrots, one white onion, one red pepper, one annheim pepper, cilantro, garlic, garlic powder and four grilled chicken breasts. 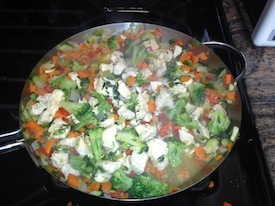 This entire pan is just 685 calories…..for ALL of it! Eat it with quinoa and it’s 1,515 calories and is enough for 8-10 servings. As if you need more evidence, a single Chipotle chicken burrito with all the fixings has roughly 1,200 calories in it. So next time you plan a meal, take a little time to bulk up on low-calorie ingredients and you’ll save big in the end!